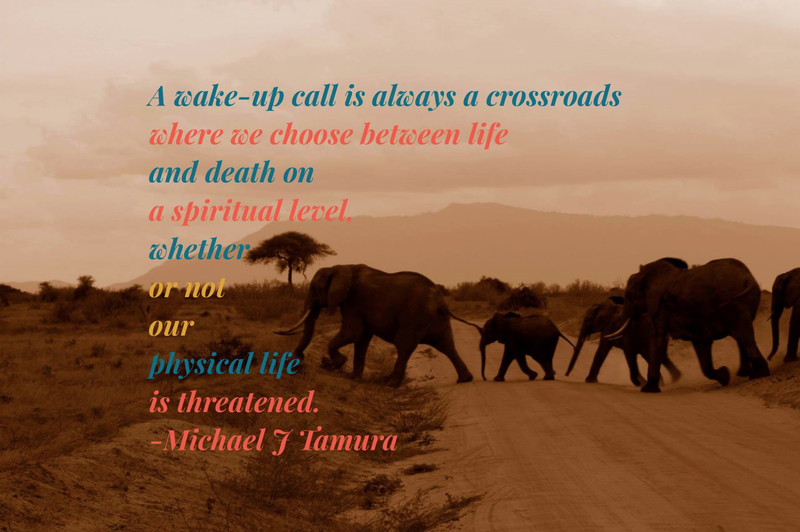 A few days ago, I posted a blog about how a world renown spiritual healer, Michael Tamura, rid me of a persistent cough, a cough which had defied treatment from western medicine, and had deteriorated so badly that I was coughing up blood. Michael lives in Mount Shasta in Northern California with his wife Raphaelle. He’s written a wonderful book – You are the Answer: Discovering and Fulfilling your Soul’s Purpose, and he regularly conducts workshops and seminars throughout the US. He’s in high demand. I asked him if he’d like to write a guest post about my healing from his perspective. Bill Bennett is a delightfully entertaining as well as a deeply insightful writer. That’s why I couldn’t help but follow his blog, PGS – The Way. It’s only one of two I’ve ever subscribed to. So, imagine my pleasant surprise when I found myself reading his post about a healing that I gave him. In fact, he’s featured that particular healing experience in his blog in three different contexts over the past year: in “An Energetic Healer Heals”, “Healing”, and “Blood On The Sheets”. I’ve experienced a great deal of joy when I read each of Bill’s three posts about his healing. First, I get to share in his celebration of getting well – and staying well. Look Ma, no cough! That brings a big smile to my heart. His writing about his healing also makes me happy because, through his sharing of his experience, Bill opens the door to insight, hope, and wisdom for many others. He’s given people permission and validation that they, too, can heal themselves, even when doctors or other experts or even what they’ve already done in attempts to heal themselves haven’t reaped the kind of results they wanted. I understood that the cough that Bill had was not your run-of-the-mill variety. It was a serious chronic condition that was starting to have quite a deleterious effect not only on Bill’s health, but also his quality of life. Besides, he was waking up with blood splatter on his sheets from coughing so hard through the night. That’s a bit scary by anyone’s standards. And, no conventional medical treatment helped. As hopeless and terrifying as that may seem, if examined under the correct light, you can see that it was one of the best things that could have happened to Bill, at the time. In truth, the seemingly “incurable” and worsening cough was already part of his greater healing process. I learned early in my life to have complete certainty that nothing happens by accident – even accidents – ever. Even more than that, I have total certainty that Spirit always uses every experience we ever have in our lives – no matter how joyful or horrible it may seem to us at the time – as the perfect opportunity to teach us what we need to learn, when we need to learn it. Perfect lesson, perfect timing. Always. Without fail. Spirit never fails to deliver. Yet, we were given free will and we can exercise our choice in willingly accepting the gifts we are offered or in ignorantly rejecting them. It truly is up to each and every one of us, whether we choose to restore ourselves to our intrinsic wholeness or stubbornly lick our wounds in the isolation chamber we build in our own mind. Whenever we face that seemingly insurmountable wall that seems to tell us, “nothing works”, we are on the verge of waking up to much more of who we truly are. We’ve been to doctors and experts and tried everything in the book and everything we know to do, yet, nothing seems to help us with our health condition or relationship or life situation. We’re stumped and desperate. There seems to be no way out of our predicament. And staying in this condition or situation much longer seems unbearable. We’ve already turned to everyone and everything that we can think of that might be of help. Ah! Therein lies the rub. We’ve been thinking too hard, trying too hard. We’ve been rummaging through the same old drawers in our mind – relying on our accumulated knowledge. When we’ve got ourselves between the proverbial “hard spot and a rock” and can’t find our way out, we need to look in the one place we haven’t looked yet. We need to look within. We have to go beyond our intellectual knowledge, beyond our reasoning, to our intuitive knowing. Waking up means looking within our own beingness. We need to discover what the limitlessness and eternity of Spirit is constantly showing us. That’s all I ever do. And when I see what is being shown, I follow through on its guidance. It’s that simple to have a miracle. It’s so simple, most people can’t fathom what I do or how I do it. Although Bill so graciously gives me credit for the miraculous healing of his cough that the best doctors and medicines couldn’t touch, that credit is somewhat misplaced. You might say that as a healer I’m more like what an experienced Egyptian tour guide is to a first-time visitor to the Cheops Pyramid. The tour guide didn’t commission, design, or build one of the wonders of the world, but he can lead the visitor to it to see and experience it for himself. Similarly, when I say that I “gave” someone a healing, I merely guided him to experience the truth that was already within him that he wasn’t quite seeing for himself yet. Also, a veteran tour guide would know about the various details of the ancient artifact that would help expand the visitor’s understanding, appreciation, and enjoyment of it. That’s essentially what I offered Bill in my communication to him during that healing session – just a few of the details that were obscuring his awareness of his underlying wholeness. Just as the illusion of darkness disappears when we turn on the light, illness cannot exist in the light of truth. We are healed, when we see the truth. Due to the inherent limitations of verbal language, we speak of healing as a kind of action: I’d like to have a healing; please heal me. It tends to connote that someone or something is doing something to effect wellness and improvement in his condition. Yet, Spirit is always and forever whole. The real you is always healthy. It’s only when you ignore or invalidate yourself that you produce conditions in your body and the world around you that bring about suffering. So, our experience of healing is dependent upon our awareness and certainty in that pre-existing, underlying wholeness of life – of Spirit. It’s not about “getting” something or “doing” something in order to make us more whole. True healing is not any “treatment” to effect a “cure”. We can, however, do certain things that will help us become more aware of our intrinsic wholeness that we’ve long ignored or forgotten. A healer, like myself, merely points the way to that experience of spirit and wholeness. That is why, for me, healing and teaching are simply two sides of the same coin. No matter what I do, I can’t make you whole or be healed, because you already are. If I succeed in helping you to see that and you let go of the illusions that you previously believed as true, you will experience being healed. You will see more of your wholeness and your body and the world in which you live will reflect that. What you hold in your mind is what you experience as the world and your life in it. Bill was more than ready to discover the truth and the wholeness that he already is. Showing him the way to it was easy. That, however, isn’t necessarily true with everyone who asks for healing. In some ways, the most challenging part of healing yourself is getting yourself to that place of willingness to accept yourself as you truly are. Until you get to that, you’re in competition with yourself, which means that you feel you are not enough just as you are. Then, you’re going to be afraid of the healing that will reveal more of who you are. If, on the other hand, you know “how great thou art”, how brilliant and beautiful is your light, you would welcome wholeheartedly anything that will reveal more of the real you to you. That is the experience we call “loving”. The true Art of Healing is the practice of loving until we all realize our divine, undivided wholeness – limitless and eternal. Now, some of you may be interested in what I personally experience as I give someone such a healing as I offered Bill. What is this wild fluttering of my eyelids and twirling of my hands that he reported he saw during his healing session? Where did I “go” when Bill observed that it was apparent to him that I was “truly somewhere else”? First, I’d like you to know that I’m not the kind of healer who normally “gives” individuals private healing sessions. You can’t call our office and schedule a session with me. I offered Bill the healing not only because he needed it, but because it was a way I could help him awaken to the next step in his spiritual advancement and fulfillment of his purpose. Remember, earlier I mentioned that healing and teaching are merely two sides of the same coin: I teach you to heal yourself and you become well. Healing is predicated on your willingness to wake up to the truth of Spirit. As it has long been said, “Many are called, but few choose the truth.” Even today, the majority of humanity prefer to stay asleep in the apparent comfort and security of illusions. Bill, on the other hand, has long sought the truth, but at the time I met him, he was struggling with some trepidation of what would happen to him, if he shared the truth openly with humanity. I wasn’t interested in “curing” Bill’s cough. I was supporting a great teacher who is guiding many others. When you fulfill your purpose for being here, everything else is taken care of: your health, finances, relationships, home, etc. Don’t worry, be happy! So, what’s happening when my eyes are fluttering? It’s nothing important, actually, but merely a bodily reaction to me going deeper within and stepping up my vibration. One’s eyes need not flutter, but mine seem to do so at times. You might notice that sometimes when a person goes into a very deep meditative state, his eyes my flutter as well as his eyes roll upwards as if, under closed eyelids, he is straining to look up. What’s happening in both my case and in the meditator is that the body’s eyes are following the trajectory of the soul going further “out” of the body. When I am “going out” of the body, it just means that the vibratory rate of my soul-self is much higher than the vibratory rate of the body. In truth, there is no “there” or “out” in relationship to “here” or “in”. Spirit is all one, undivided. When you look and see with the undivided eye of Spirit, then, you start to see beyond the images you unconsciously hold within your mind. You begin to see the light of Spirit. At first, you begin to see the truth that the illusions or mental images that you’ve been looking at and believing in as truth and reality are neither true nor real. This is you learning to discern the truth from all the lies that only previously appeared to be true. This is the clairvoyant development that I teach. When Bill wrote in his posts that I told him things in his life that only he knew about, as amazing as that may sound to many people, it’s what we all do all of the time. The only difference between me and you is that I am aware of a bit more of that than perhaps you are at this point. Why? Because I don’t isolate myself from you quite as much as you do yourself from others. In other words, I’m not as protective of “secrets” as perhaps you might be. I can’t be clairvoyant and teach people to become more clairvoyant and worry about hiding things from others, can I? Bill was quite easy to read deeply because he doesn’t have too much he feels he needs to hide either – at least, not from the likes of me, who he knows isn’t interested in using sensitive information against others. Like I mentioned before, he’s interested in finding out the truth, not hiding from it. Remember, no truth, no healing. You gotta love it! When I’m looking “into” others, I’m not really looking into “them” – I’m looking into the oneness of spirit that we all are. That’s the only way you can see “someone else’s” inner life. Mind, where we store the images of our life experiences, is also one. What we talk about as “my” mind and “your” mind as if they are two separate minds isn’t true. It’s more like two rooms in the same house. We believe that they are separate only when we keep staring at the walls that seem to isolate one room from the next. In fact, it’s even more like political borders between countries – it’s one landmass, but arbitrarily “divided” or “walled-off” as two “separate” countries. There’s not even physical wall dividing the two. It’s all in our mind, isn’t it, this “separate countries” business. Just as two countries share an imaginary “border” that “separates” them into two countries, we each share imaginary borders that makes it appear to us that we are distinctly separate persons. And, as long as we believe we are the bodies that we seem to be identified with, we keep living the illusion of separateness. If we believe we are separate, how then can we ever get to know another person more than skin deep? In reality, there are no walls that keeps us from getting to know one another intimately. And, this is the true intimacy that everyone craves to experience with others, but believe that it is beyond their reach. Now, the bit about me twirling my hands around “like an orchestral conductor” or feeling with my fingers the air around Bill during the healing, I told him that I’m part Italian! Hahaha… I “talk” with my hands all of the time. Actually, what I’m doing when you see me doing that can be one of several things. I used the tiny energy centers in my fingertips to both “read” energies in a person as well as direct energies in them. It’s actually very much like conducting an orchestra. I also use the larger energy centers in the palms of my hands to gain information as well as move energies. Do I absolutely need to use my fingers and hands? No. It just makes it easier and more convenient at times. If, for example, I had to do the same thing in the middle of a public arena, I wouldn’t necessarily close my eyes or wave my hands around. It’s a bit like sitting in a concert listening to a rockin’ tune – you can sit still and listen, but it’s so much more fun, if you dance to the music. After all, in both dancing to the music and healing yourself with Spirit, you are expressing your creativity and sharing yourself in the oneness of Life. I couldn’t have described the arc of a healing more concisely or eloquently. Every healing is a demonstration of the miracle of living as spirit, here in the body. It defies reason. Awakening to that miracle is the healing and owning it makes you the living proof that you are spirit, not a body. And, even a momentary glimpse of God’s Love leaves us speechless, in awe. I’m in awe of your amazing knowledge of the spirit world and how we work. I’m getting a late start on learning about all things spiritual and about our souls. My husband and I walked the Camino three years ago and had started to follow Bill’s blog. We had the great opportunity to meet Bill and Jennifer twice, once here in Seattle and again in India. Until that time I had just lived my life day to day. Raising children, working, eating, sleeping and doing it all again the next day. Meeting them has set me on a quest of knowledge and understanding. My reading list has grown long but as soon as I hit the post button your book will be ordered. It truly amazes me that I have lived 69 years without searching out the truth until meeting them. You are so correct that nothing ever happens by accident. Looking forward to learning with your books. Hello, Lynda! There is never late or early to waking up to Spirit, since Spirit is eternal. Raising your children, working, eating, sleeping, and doing it all again the next day are all part of our spiritual growth. In fact, the whole purpose for us to be here is to learn. And, spiritual learning can only come by living life and distilling our experience into wisdom. Reading a good book can inspire us and guide us, but only through living life do we grow. I hope my book inspires you and that you find it a helpful guide on your greater pilgrimage of living your life, but truth you can only find within your own beingness. That’s the great news – we don’t have to look too far – just deeply! I am so glad that you met Bill and Jennifer and experiencing those two bright and beautiful souls inspired you to go further along your path. It was no accident at all! They are great teachers and guides. Enjoy your continuing pilgrimage! (And, never underestimate your worth or your wisdom that you already have). Thank you for your kind message, Ingrid! I’m happy that you enjoyed the piece. My maternal great-grandmother was a healer, though she combined ancestral knowledge of herbal and similar treatments with her deeper art. We can, however, do certain things that will help us become more aware of our intrinsic wholeness that we’ve long ignored or forgotten. A healer, like myself, merely points the way to that experience of spirit and wholeness. Every true spiritual healer gifted by God states some variant of this principle. Hi Michael, my personal journey has included a couple of healing sessions with a gifted energetic healer and at the time found it to be restful and special. But, more than ever, have a growing inner knowing that it is me that heals myself. My growing grew even more with a recent experience with a good friend who could see that I had an entity on me and said to me you can rid of it. She told me how and I did as I was told. I could feel this entity leaving. I am grateful for this teaching and learning experience. This is what I love. So many like minded souls helping each other – we are indeed all one in this universe. Hello, Angela! You are most welcome, of course. I’m delighted to hear that you have a growing certainty that all healing comes from that limitless wholeness that is within you. The more you trust in that knowingness, the more you will demonstrate to yourself that it is true – as you have experienced. And, as you wrote, we each begin to see the reality that this is only one of us! The “grace of healing” is mentioned separately, because by its means a benefit, namely bodily health, is conferred on man in addition to the common benefit bestowed in all miracles, namely the bringing of men to the knowledge of God. I do not like the trailer to Terrence Malick’s next — the imagery is very beautiful, but the transcendentalism is fake. Material processes are not “past, present, future” — they are present, present, present. The author gets many things wrong, particularly in his over-reliance on Jung. The ultimate nature of Reality is non-dual. However, life, as the average person perceives it, regardless of his or her religious affiliation or lack thereof, consists of fragmentation, dissonance and the absence of unity and cohesion. This is due, in part, to the fact that dualistic thinking is one of the primary processes engaging the mind. Dualistic thinking has its roots in the interaction and pull between Spirit and matter. From the interplay of these two fundamental polarities, all the many lesser dualities emerge. The opposites … lead to desire for one thing to the exclusion of the other and consequently to suffering and pain; to a life filled with turmoil, imbalance and conflict. An astonishing analysis, valid as much for the Western as the Eastern genuine Traditions of Mysticism. The otherwise excellent quote is flawed only by the author’s seeming inability to examine the not dual, but ternary structures of our deeper conceptions — the opposites of Yin and Yang, of the vertical and horizontal of the Cross, require the third dimension of transcendental meaning. Unfortunately our Western mind, lacking all culture in this respect, has never yet devised a concept, nor even a name, for the union of opposites through the middle path, that most fundamental item of inward experience, which could respectably be set against the Chinese concept of Dao. This is pure and simple an unwitting admission on Jung’s part of his complete and utter failure to understand Christianity. The Star Wars study linked to is also by nature a very fine introduction via modern Art to the Baroque aesthetic.